Nothing beats a spring landscape in the south. If you have a white picket fence – or any other fence, for that matter – you can help your landscape flourish by adding a generous portion rose-purple azaleas behind your fence. These azaleas will grow up and out, gently sweeping over your fence and down to the ground. The visual effect is stunning and will significantly improve your home’s curb appeal. Another option is to select Southern Indica hybrid azaleas, which grow much larger. If your fence is slated, rather than solid like a wall, you can use perennial plants like Black-Eyed Susans that have a tendency to spread their seeds from one side of the fence to another and intensify their bloom. This allows you to make a statement around your property without putting forth much effort. Asters, daylilies, mums, and Queen Anne’s lace all work just as well for this purpose. 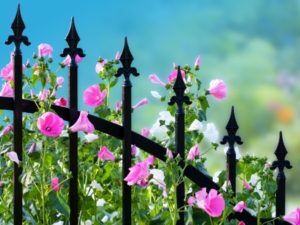 In addition to beautiful flowers, you also need a sturdy and attractive fence. West Florida Fence in Tampa, Florida is a full-service fence and gate company that offers more than 150 years of combined experience. You can call West Florida Fence at (813) 251-5883 to request a quote and begin the process of installing the perfect fence for your own property.